RiskRecon’s automated risk appetite configuration capability enables enterprises to automatically produce assessments and action plans based on their unique risk requirements, enabling risk professionals to easily understand and act on their third-party risk. 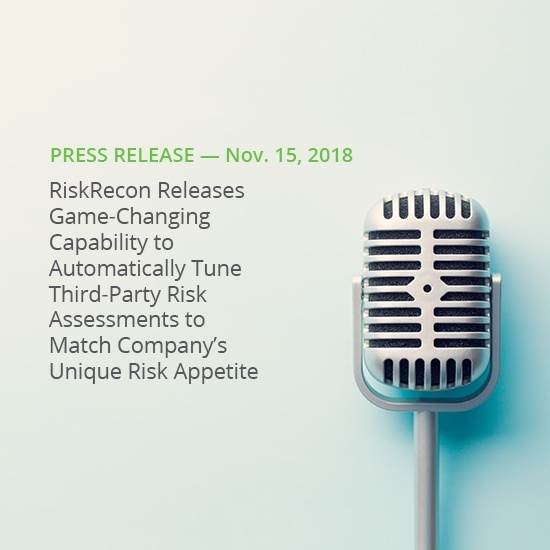 Salt Lake City, Utah, November 15, 2018 – Building on RiskRecon’s unique capability to automatically risk prioritize issues based on asset value and issue severity, RiskRecon announced a cutting-edge capability that enables organizations to automatically produce third-party cyber risk assessments and action plans that are custom-fitted to match their unique risk appetite. Customers configure their risk appetite through a simple administration interface, selecting from a set of default policies or configuring their own policy. Customers can set their own risk policy for each security criteria through a graphical user interface by selecting the combinations of asset value and issue severity to identify issues important to their organization. For example, if you are not concerned about Spamming issues, then simply deselect all cells of the Risk Priority Matrix. In addition to automatically creating custom-fitted risk assessments and action plans, organizations can similarly tune RiskRecon’s continuous monitoring to surface only the material risk issues that violate their risk policy.